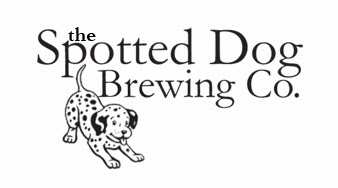 The Feast (Maine Beer Co. Dinner "Clone") -- Brew Day ~ Spotted Dog Brewing Co.
Is it really possible to "clone" a beer that you've never had? I'm guessing that this will come nowhere close to Maine Beer Co's new, incredibly well-received foray in the DIPA category, but seeing as how much I love their offerings, even something close would be an accomplishment. Their new beer, Dinner, has a score of 100 on Beer Advocate and to my knowledge can only be purchased the brewery. I've always been a huge fan of the Maine Beer Co lineup since I met the brewers at a dinner here in Philly for Beer Week a couple of years ago. That same year, we ended up taking a min-vacation up to Portland, ME (a truly beautiful place) and we had the opportunity to stop by their then new facility in Freeport. MBC truly excels at brewing hoppy ales with their Peeper, Mo, Lunch, and Another One. Given the score for Dinner on Beer Advocate, I can only imagine that they continued on with their track record of crushing hop-forward brews. Maine lists the ingredients, both malt and hops, for all of their beers, along with starting gravity and ABV. The brewery does not list any IBUs which they say "they don't calculate" which leads to me to believe they utilize a substantial whirlpool addition of hops and aren't comfortable with the whirlpool addition IBU estimates that the industry is tending to use. Given some of the vitals, it is quite obvious that they use a very attenuative yeast. 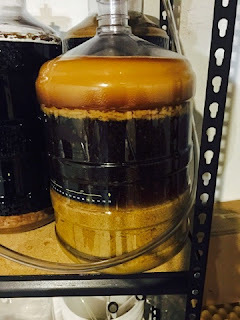 I"m not going to attempt to match their attenuation, and in fact I'm actually going to be using a yeast that seems to be less attenuative than what I would normally use. Around 2 weeks ago, I was lucky enough to log onto FB at the same time that Love2Brew offered up a new batch of East Coast Yeast products. So, naturally, I snagged some ECY29 Northeast Ale (Conan) yeast along with some Bug County that I'll hopefully be putting to use sometime soon. For the malt bill, I deviated somewhat from what they had indicated. Their bill leans heavily on 2-Row, but I'm opting for a blend of Maris Otter and US Pilsner for a little bit of complexity and crispness. According to their website, they also use C40, Carapils and Dextrose. I'm assuming both of the crystal malts are used in a low proportion and the dextrose is added to further dry out the beer. I'm also upping my OG a little bit to hit the ABV target with the less attenuative yeast. For hops, none of those listed were obviously bittering hops, so I opted to throw some Citra in for that purpose as I've had decent results with Citra single-hopped beers. Falconer's Flight seems to be a favorite hop of MBC, but I've never particularly liked it -- probably because its a proprietary blend of hops already on the market and something about that irks me. The rest of the hop timings were basically a shot in the dark with the hop bill increasing quite a bit for a whirlpool addition. Brew day went flawlessly, with me hitting the targets at every part of the brew day. I'm pretty excited for this one. 1/14/2015 -- Brewed by myself. Hit all targets perfectly. Finally getting the system dialed in post-purchase of the new grain mill. Gathered 5.5 gallons of 1.075 wort. Beautiful orange-golden color. Fermentation began within 6 hours at 63F. 1/23/2015 -- Added dry hops. 1/29/2015 -- Finished out at 1.013. Bottled to 2.4 vol. Great aroma. Nice recipe. 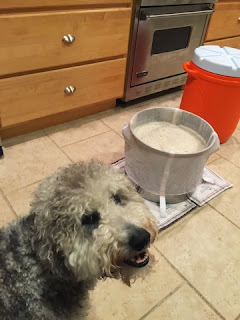 I just brewed my Dinner clone; had a little help from Dan Kleban from MBC. Plus, I've been lucky enough to have the beer a few times. I used a LOT of hops (21.5 oz for a 4.5 gal batch! ), based on their website saying they dry-hop this beer at 6 lbs/barrel - the equivalent of about 1 lb per standard 5 gal homebrew batch. I'm skeptical, but it was my 100th batch and I wanted to go big! I'll be posting the recipe on my blog as soon as the beer is ready. Hey Shawn, thanks for the comment. I follow your blog so I'll be waiting for your post. I thought this came out wonderfully, if maybe a bit high on FG as the ECY Conan strain is notoriously a low attenuator -- unlike some of the other Conan strains. I'd up the bitterness a bit next time as well. I'm re-brewing this in a few weeks, so I'll toss up another post soon. Also, I'd be terrified of a 1lb dry hop, so can't wait to see your results. How did these go guys? Im in New Zealand and want to brew something nutty big!